Capita shares have plunged over 40% after the outsourcing firm warned on profits and announced a major shake-up. New chief executive Jonathan Lewis said the company had become “too complex” and “driven by a short-term focus” and needed to change its approach. Capita, which issued a series of profit warnings last year, has again cut its profit forecast and revealed plans to raise £700m by issuing new shares. The move comes after outsourcing rival Carillion collapsed earlier this month. 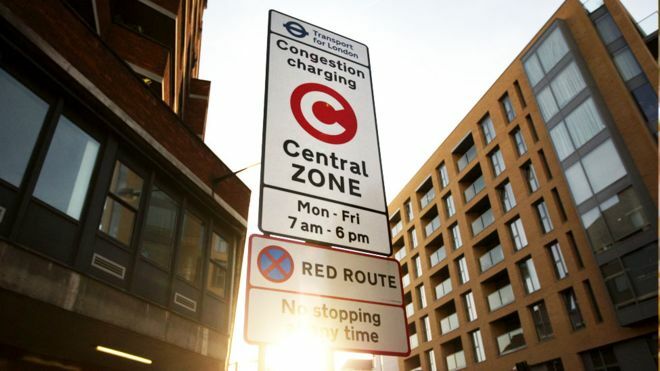 Capita operates the London congestion charge, runs the government’s Jobseekers Allowance helpline and administers the teachers’ pension scheme. It also collects the TV licence fee on behalf of the BBC. A Cabinet Office spokeswoman said as a “strategic supplier” Capita was always monitored by the government. Mr Lewis, who took over two months ago, said a review had found the company worked across too many markets and services, meaning it was difficult to “maintain a competitive advantage” in every business. Capita had relied too much on acquisitions to drive growth and had also seen weakness in new contracts, he added. 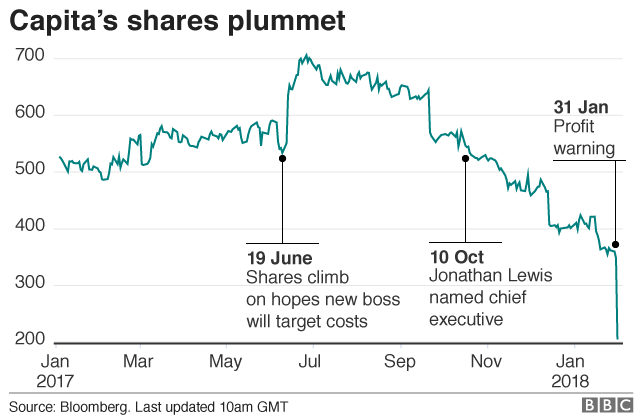 A calamitous fall in the share price – off by over one-third, reducing the company’s stock market value by £800m – looks the worst possible news for Capita. But if Carillion had made an announcement like this a few years ago – raising money to pay off debt, admitting a slow-down in the market, owning up to both underinvestment and an over-reliance on buying other companies to find growth – then it might still be with us now, rather than languishing in the arms of a liquidator. Instead, Capita’s new boss, Jonathan Lewis, has decided to take evasive action early. Chief executives are normally afforded only one chance to hit the reset button in their time at the top, and the smart ones take it early, and hit the button hard. That is what Mr Lewis has done. His diagnosis of Capita’s woes could have been taken from one of the many Carillion post-mortems; and by taking harsh financial medicine now he has probably ensured that the company does not suffer Carillion’s fate. The market seems to think so; while the share price fall is sharp, it is roughly in line with the dilution of existing shareholders implied by the £700m rights issue. In other words, investors are giving Mr Lewis the benefit of the doubt. Mr Lewis plans a wide-ranging overhaul including cost cutting and selling unprofitable businesses. The firm will not pay a dividend to shareholders this year. Annual profits are now expected to be between £270m and £300m – well below analyst expectations of £400m. In a conference call after the announcement, Mr Lewis said overhauling Capita would take at least two years, but he refused to say how long it would take for the group to recover. There was “much to be done”, but Wednesday’s announcements were the “first steps on the road to recovery,” he said. Neil Wilson, senior analyst at ETX, said signs of problems had been building at the firm, including the loss of “a lucrative and profitable contract with the Prudential” in January. Frances O’Grady, the general secretary of the TUC, said the profit warning from Capita was “really worrying” and urged the government to act. What does Capita actually do? Capita offers customer management services, including the operation of call centres, for public and private sector organisations. Its customers include O2, M&S, John Lewis, local councils, the Army and the Department of Work and Pensions. The firm’s biggest contract is its management of O2’s call centres. The 10-year deal which was signed in 2013 is worth £1.2bn. It is also the UK’s leading provider of software to emergency service control rooms and also runs the Ministry of Justice’s electronic monitoring services for criminal offenders.